Thank you very much, will add it as soon as I can. Any possible way to show tier? Something that might be added in the future. Not a trivial change. - Can you make the scroll wheel in the Instance Item window scroll appropriately? Currently 1 mousewheel scroll tick moves down like 5 pixels and it's almost impossible to scroll the list using a mousewheel. You have to use the vertical scroll bar. - Can you reduce the missing items/progress indicator for instances that share loot between two raid sizes? 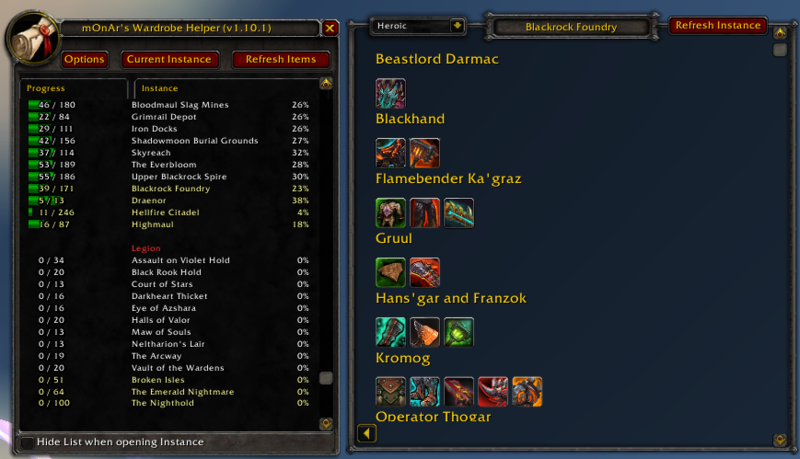 i.e., all the loot I'm missing from 25H BWD or Firelands is the same as the loot I'm missing from 10H BWD and Firelands. Those can be condensed. When i do the exact things you described in the "Usage" Part there is on the right side only the loot from the dungeon atop the list. When i click on another name the loot doesnt refresh on the right side, not even when i click on "refresh instance". Thank you for reporting the bug. Gonna release a hotfix that hopefully fixes it (Not sure because for now not exactly sure why it happens). Please add a confirmation popup for the Refresh Items button. It freezes the UI for a few seconds and the user should be warned for that. This is a Great Addon ideia, congrats! But when i open it or /mwd, it doesn't show any instance... chance of any help here? what should i do? You need to click the Refresh Items button. If it still doesn't work then it might be bug which I'm not aware of. Currently you can keep only the right side of the addon (the one with transparent background) open and hide the list on the left, if you check the checkbox on the bottom left of the list window. This is the addon that I've been waiting for! 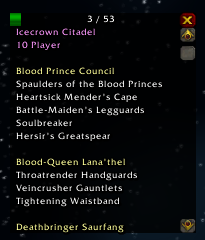 I do have one request though - It would be awesome if it could scan gear from professions as well, and then create a list of all the materials needed to craft everything missing. Do you mean from your currently learnt professions on that specific character? (*temporary) = "attempt to index local 'o' (a nil value)"
You have to completely restart your game after updating addons.